One never quite knows what to expect from Josh Rouse. The nomadic, Nebraska-born singer-songwriter’s first few albums introduced a musician whose contemplative, sometimes moody songs compared favorably to work by introspective artists like Neil Finn and Pete Yorn. By the time of 2002’s Under Cold Blue Stars, Rouse was adding subtle jazzy and modern electronic textures to his work, while 2003’s aptly-named 1972 was in places a stylistic throwback to AM radio sounds of a bygone era. Nashville  placed the focus more on acoustic sounds, all in support of Rouse’s always alluring songwriting. Relocating to Spain, Rouse absorbed new influences and applied those to his work, going so far as singing in Spanish on parts of 2010’s El Turista. Released in 2011, Josh Rouse and the Long Vacations flirted with baroque pop and Americana, though Rouse’s music had long drawn from both styles. 2013’s The Happiness Waltz had a quiet, late-night vibe, and The Embers of Time from 2015 was an inward-looking collection with flashes of gallows humor. 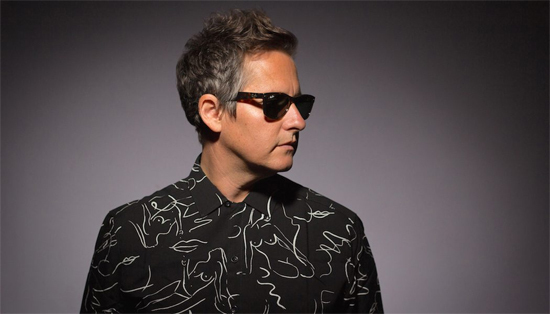 For his latest album, Josh Rouse has taken a stylistic left-turn … or perhaps even a u-turn. Love in the Modern Age is crafted around a 1980s MTV-era vibe, with analog synthesizers, vocal processing and drum machines coloring the character of his reliably compelling songwriting. The North American leg of Rouse’s tour neared its end with a May 25 show at Terminal West in Atlanta. What was the thinking behind the particular sonic texture that you’ve adopted for this album? I didn’t think about it too much. I had a couple different ideas, a bunch of songs. I think I started “Love in the Modern Age,” and “Businessman,” and maybe another one with my friend Daniel Tashian, and those were definitely in a kind of synthesized world. I grew up in the ’80s, so I was familiar with those sounds. And I had been listening to a lot of that [kind of] music around that time as well. I had a whole other [album’s worth] of things and a lot of different directions I could have gone in. But my manager and I thought, “This would be something kind of different from what I’ve done the last few records. It might be nice to mix it up.” So that was it, to be honest. Once you had the theme in mind, did that color the character of the songs you would write, or did you just apply that ’80s synthpop aesthetic and style to the songs you had already written? A bit of both. You know you’ve got a record when you’ve got four songs that are kind of your basis. And that’s the way this record worked. If it’s a good song, it can be country-ish or it can be new wave; you can do anything with it. “Love in the Modern Age” and “Businessman” had a mood, and that mood set the record. But there might have been a few where I had that sort of “Hey, let me try it this way.” Because I could have done the song “Ordinary People, Ordinary Lives” in a David Bowie style. I remember when I first played it for a friend of mine; he said, “That reminds me of ‘Rebel, Rebel.’” So there were a few that I treated in a certain way to make them fit with the record. Yeah, it’s like a Vocoder, but it does harmonizing as well. It’s like Kendrick Lamarr. I think it’s used in modern R&B and hip hop a lot. And I thought it would be funny to put that on my stuff! When making Love in the Modern Age, did you use vintage ’80s gear, or modern digital plugins that replicate it? Again, a bit of both. A friend of mine has a bunch of old keyboards that we used: Roland Junos, Kurzweils and stuff like that. But we have some plugins that sound amazing, too. You were a teenager in the ’80s. And even though you covered The Cure years ago, the influence of what we call “college rock” isn’t really apparent in much of your catalog. What were you listening to in high school? Well, that stuff. The Cure were a big band for me. So was R.E.M. and – like you said – a lot of that college rock. At 16, I really got into the UK stuff like The Smiths and The Mighty Lemon Drops. I found out about all this stuff through 120 Minutes, which was on MTV. They’d play The The and stuff like that. I was just living in small-town America, so I found out about those bands through that program. And you know what? Years later, February 2003, I got to be on 120 Minutes. I remember my manager asking, “Hey. Do you wanna be on 120 Minutes?” And I was like, “Are you kidding me? That’s a dream come true!” That was a lot of fun. But I found out about groups like Prefab Sprout and the Blue Nile through videos that were on MTV when I was in high school, or on college radio station. So it was fun to do this record, because it brought up some nice memories. I can look at where I am today and say, “Wow. All those dreams I had of doing that kind of came true to some extent.” I mean, I play in the UK all the time, and I’m in the magazines over there. And it’s nice to remind yourself that you don’t always have to work so much all the time to try to get somewhere; sometimes you can just look at the things that you’ve done. So Love in the Modern Age is, in a way, a romantic record for me.